Venezuela’s economy has been deteriorating at a fast pace following the death of former president Hugo Chavez. Despite the increase in protests and rampant inflation, the country’s bond markets continue to be strong performers. The government continues to make multi-billion-dollar bond payments to investors even as its citizens queue in lines for necessities — a conundrum that has many experts perplexed. In this article, we will look at Venezuela’s worsening economic turmoil and why the country continues to pay its sovereign debt. Venezuela has a long history of delivering exceptional returns to bondholders. According to Bloomberg, the country’s bonds have returned a total of 517 percent in the 17 years since Hugo Chavez came into office and offer an attractive 26 percent yield today. This performance makes Venezuela one of the best performing bond markets in the region, despite the tremendous amount of political and social turmoil that it has faced. The leadership has stated that debt repayment is the honorable thing to do and avoids the strings attached to bail-outs, bail-ins, and defaults by the International Monetary Fund (IMF) and World Bank. Many Latin American countries are critical of these organizations because of the way that past crises have been handled around the world. After all, they often insist on austerity measures that are politically-difficult for historically socialist leadership. Venezuela’s economic crisis has significantly deepened following the death of Hugo Chavez. After Nicolas Maduro took power, he quickly acted to silence the opposition by trying to dissolve the National Assembly and cracking down on protests occurring throughout the country. Attorney General Luisa Ortega Diaz and Defense Minister Gen. Vladimir Padrino Lopez remained silent in the beginning, but have since become more vocal in possible opposition. On June 19, 2017, Latin American foreign ministers gathered to meet in Mexico to discuss a response to the worsening crisis. The response from the country’s neighbors could accelerate Maduro’s departure from power, but the peacefulness of the transition will depend on how far government officials and security forces are willing to go to keep him in power. And, that will depend largely on Attorney General Diaz and Gen. Lopez. In the meantime, the country’s economic decline has accelerated. The 2014 collapse in crude oil sparked a crisis that worsened as the country’s leadership nationalized large parts of the economy and issued more and more bolivars to stimulate spending. With just $12 billion left in hard currency reserves, the country is rapidly approaching a crisis where it will literally run out of money to fund basic human services and, potentially, debt repayments. 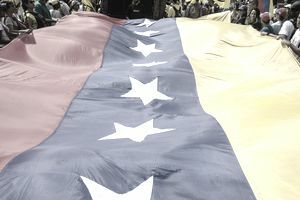 Venezuela may seem in dire financial trouble given the lack of hard currency in reserves and the upcoming debt payments still owed to creditors, but there are several reasons for the country to continue paying its debts and pathways to keep it from defaulting. The most obvious solution to the crisis would be a rebound in crude oil prices, which could quickly turn around the country’s finances. With prices already starting to recover, the country’s leadership may be tempted to hold out to avoid the repercussions of a default. After all, a default could deepen the country’s cash squeeze by triggering legal action from creditors that could inhibit its ability to export crude oil and generate revenue. Venezuela could also potentially improve its financial situation by raising additional capital through private deals like the recent one with Goldman Sachs. The iconic investment bank paid about $865 million for $2.8 billion worth of bonds issued by the state-owned oil company Petroleos de Venezuela SA and the government. These issues could be attractive in today’s low-yield environment and provide a bridge-loan until crude oil prices recover. Institutional investors may purchase individual Venezuelan bonds directly, but individual investors may want to consider exchange-traded funds (ETFs). These funds provide investors with a diversified portfolio of bonds rather than an individual bond that may experience country-specific — or even issue-specific — problems. Of course, the downside is that these funds don’t provide direct exposure to a particular bond or country. It’s important to keep in mind that Venezuela could very well default on its sovereign debt. In fact, the high yields and low prices suggest that the market sees an eventual default as likely to occur. Investors in these funds could experience some losses if this occurs, although the diversification of the funds will mitigate the impact. Venezuela’s economic crisis has worsened considerably since the death of Hugo Chavez, but the country continues to pay its sovereign debts. There are several reasons for the country’s insistence on prioritizing debt repayment, including the possibility of a recovery in crude oil prices and the complications associated with a default. Investors interested in gaining exposure can most easily do so through emerging market-focused exchange-traded funds.